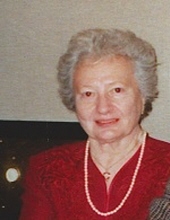 Mildred Pelcher Brewer, age 90, of Doraville, GA, peacefully passed away Tuesday, January 22, 2019. A family graveside will be held at North Atlanta Memorial Park and Chapel Mausoleum on Thursday, January 24, 2019, at 2:00 pm. Mildred was preceded in death by her loving husband, Stansel Roy Brewer. She is survived by her sister, Mary Ann Hipwell residing in Wynanskill, NY. Her three children, Ann Jarrell, Steve (Joyce) Brewer, Diane (Donald) Fox; three grandchildren, four great-grandchildren; one great-great grandchild; plus countless nieces and nephews. Online condolences may be expressed at www.crowellbrothers.com. Arrangements entrusted by Crowell Brothers Funeral Homes & Crematory, 5051 Peachtree Industrial Boulevard, Peachtree Corners, GA 30092. To send flowers or a remembrance gift to the family of Mildred Pelcher Brewer, please visit our Tribute Store. "Email Address" would like to share the life celebration of Mildred Pelcher Brewer. Click on the "link" to go to share a favorite memory or leave a condolence message for the family.